Germany, the Netherlands and Switzerland are enhancing their reputation for punctual trains with new computer software to manage schedules, the European Commission says. 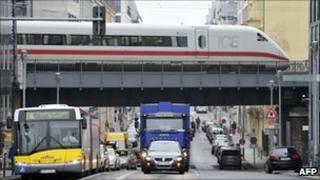 An EU-backed project called Arrival has cut delays by managing rail traffic more efficiently, the Commission says. Arrival algorithms were used to draw up a new rail timetable in the Netherlands and cut waiting times on Berlin's U-Bahn underground to just two minutes. The EU funding was 2.6m euros (£2.2m). Italy is currently trialling the Arrival technology in Palermo and Genoa. "This first-class European research allows more passengers, more freight and goods on more trains to safely use the same infrastructure while increasing punctuality, passenger satisfaction, and operator profit," said EU Digital Agenda Commissioner Neelie Kroes. The Commission says the algorithms have potential applications in the management of road traffic flows and industrial work-flow systems. Researchers from 12 universities - in Greece, Spain, Italy, Germany, Switzerland and the Netherlands - and the French national railway company SNCF worked on the Arrival project.